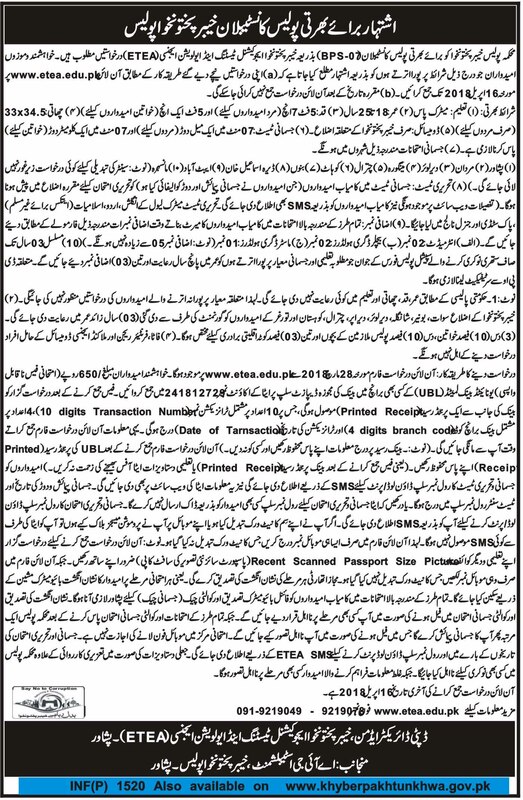 Government of Khyber Pakhtunkhwa has announced New Jobs in Police Department Published in Daily Mashriq Newspaper 28/03/2018. Interested Candidates Who Fulfill the Educational Requirements as well as Physical Requirements can apply for KPK Police Department Jobs 2018. Physical Test will be Held in Following Cities Peshawar, Mardan, Dir Lower, Mangora, Chitral, Kohat, Bannu, D.I Khan, Abbottabad and Mansehra. Entry in Test Center will be made through after Biometric Scanning. Candidates are directed to apply online at Khyber Pakhtunkhwa Educational Testing and Evaluation Agency (ETEA). Applicants are advised to download Challan Receipt and Deposit it to Any United Bank Limited Branch, After deposit candidates will receive a receipt and applicants are advised to keep this receipt in his own custody as this is necessary during online apply. Don’t provide Your portable mobile phone number.